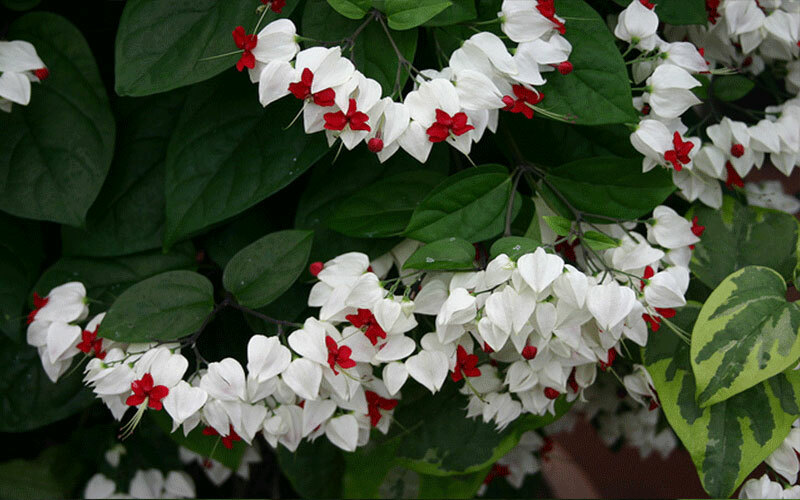 This vine blooms on and off all year more in milder weather with frilly clusters of snowy white heart-shaped flowers. At first glance, it appears that each little blossom is tipped with a touch of scarlet. 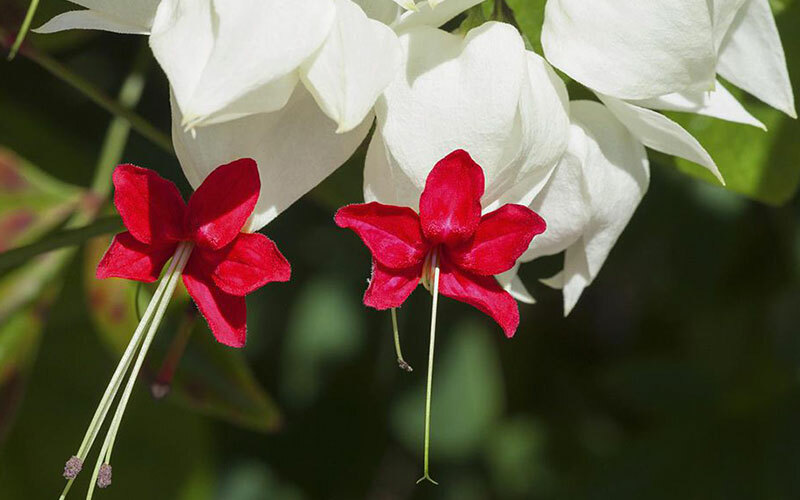 The white part is actually a flower "bract" from which a red flower emerges. Leaves are a soft dark green and contrast beautifully against the white. The foliage tends to stay darker, fuller and more lush in part shade. In full sun the leaf color fades to a medium green and growth is less dense, though you'll get more profuse flowering. 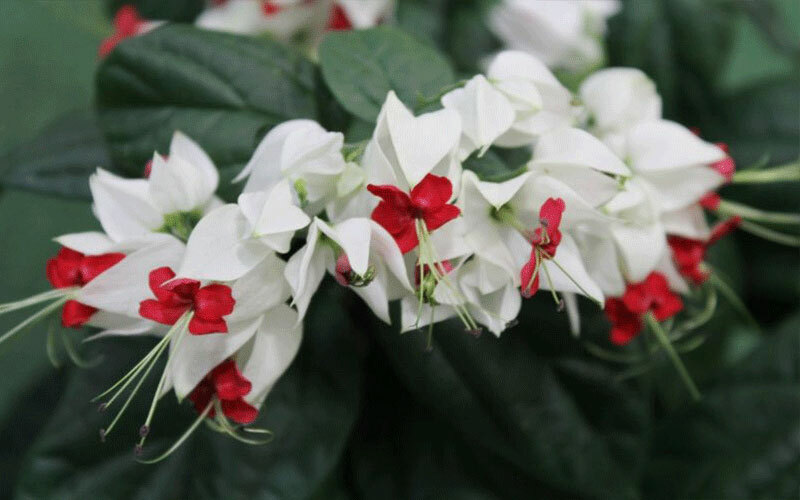 Planting the Bleeding Heart is a "twiner" so be prepared to give it room to climb and grow without anything too near it that could be overtaken. Though it's fast, this is not a vine that goes crazy-rampant like some others, but anything that sends out tendrils is looking for something to grow on, so give it a trellis or fence or other support to keep it in check. 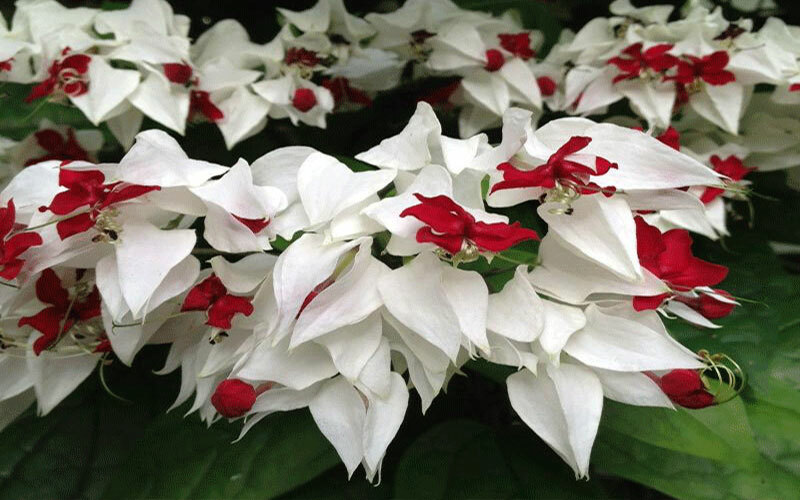 There is a lesser-used red flowering variety, with blooms that fade to pink and then purple. The white bleeding heart flower bracts fade to a pinkish lavender after the tiny red flower drops off, adding more color to the show. These vines grow fast (though less so in shadier spots) and can take full sun to part shade. They do best in an area sheltered from wind. If growing several along a fence, plant them 3 feet apart. Keep these vines at least 4 or 5 feet from the nearest shrub or tree.